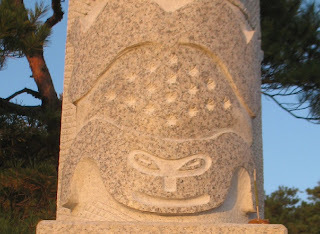 I had the pleasure of spending five weeks in Korea where I sculpted a totem pole from granite. It was a wonderful, yet frantic, experience. I am pleased with the result and will hold memories of my time there forever. The people were warm and welcoming, the material was beautiful (although very hard), the food was beautiful and delicious. Scroll to the bottom of this post and click "previous posts" then scroll down to the begining of Haslla to see my whole trip chronologically. After taking pictures I hurried to get my things packed. This is the last thing I saw as I left on the bus. We got to the station 2 minutes before the bus left. As always between artists hugs, heartfelt goodbyes and promises to see each other again. 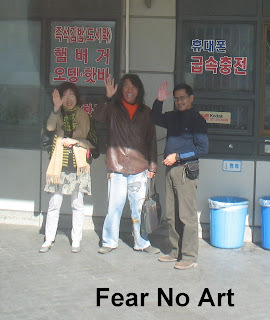 This is my last photo at Gangneung, Professors Shin Jung Park, Choi Ok Young and Noell El Farro. Some Fear No Art stickers were distributed in Korea (about 500). It will be cool to hear that someone has seen one and as a result "bumped" into someone who I have known in the past. There are about 2000 of them out there now, mostly in China, Russia, Thailand, Viet Nam, Korea, Canada and some in many other countries (too many to list) taken there by artists I have had the good fortune to work with. One of the hotel staff came up with us this morning and took a picture of Noell and I beside "Finding Your Way" Each element has a meaning in Canadian native lore, a totem pole is read from bottom to top-the lowest is the most important or subject of the piece, gives a new perspective to "low man on the totem pole". I didn't get great shots but Noell promised to take some more pics during his remaining two weeks and email them. I don't know how he will do it as his sculpture is a big job and he is working hard to stay on his schedule. I included something decorative in each element, on the frog his spots are actually starbursts, you can just make them out if you look closely. Each element also included some polish and the sun was glinting off of them this morning, beautiful I think. Four busloads of school children showed up this morning. They are really cute all in matching uniforms complete with backpacksw. I have learned a little Korean, called out "awe zao yogi" to get their attention, "hello, over here". On Oct 29 two sculptors that I worked with for a month in Russia drove to Haslla to visit. It was a double reunion as Lee Sang Heon (on left) had shown with Prof. Choi in Seoul 25 years ago. Kim Bong Soo is seated next to Sang Heon. I know him as Bong Soo Kim so Prof. We went to a restaraunt where you cook your food at your table in a big skillet that is built into the centre of the table. We drank soju (18% wine) mixed with beer, they call it Pok Tan Ju (liquor bomb) ju is the word for alcohol. Quite good but can sneak up on you!! The head of the eagle is blocked out now. I will start to detail it and create some cheeks and jaw muscles but it will still be stylized in following with traditional wood totem poles. Ghang zun in Korean language. The eagle's head is the last piece to begin working on. When it is basically finished I will start to detail it and the other forms. The nose and eyes of the eagle will be polished, some decorative designs on the wings of the dragon flies etc. The dining room staff are always really pleasant and super attentive. L-R Chung, So Young and Soon Mia. A small group of students visited this day, they are all interested in what I am doing. In Korean the closest I can come is Changzun for the word "totem pole", my pronounciation is not quite right as I have to repeat myself several times before they get the connection. A really nice man is the grounds keeper and although he doesn't speak english (really I should say "as I am in Korea and don't speak thier language", we kind of communicate by sign language. When he brought this snake over he didn't have to say anything anyway. It is some kind of poisonous viper but my close up shots of it's head didn't come out in focus. I took this photo at 3:30 am when I came down to work, I couldn't get up high enough to get everything in the shot but you can see half of the eagles wings and the design, I think they will look pretty nice when they are dry (raining and windy this am) as the design is polished out to 3000 grit so it will be black, the rest will be almost white because it is a chiseled surface. There is the form of a whale in the ovals at middle and top of the wings. Now that I am near completion and my time is running out I am working long hours, yesterday from 3 am until 10:40 pm. It reminds me of "The night of long knives" in St. Jean Port Joli, Quebec. The last night of thier snow sculpture event artists are allowed to work from 8am Saturday until noon on Sunday, almost all of them do, adreneline keeps you going....About every hour the organizers come around with hot refreshments and snacks etc. Same thing here at Haslla, the organizers and staff work really hard at making sure we have the things we need to keep our moral up our bodies working. I think if they didn't come and take me from the work site for breakfast, lunch and supper I would forget most of the time. I should have made a point of checking out how the paste is made but this is the press in action. It pushes the buck wheat mixture through a sieve, the paste must be really thick because it takes a pile of force to get it to come through the holes in the press as you can see. other is a painter. Both are graduates from Prof. Park's university in Seoul. The press that makes the noodles is behind us. Noell has been here for a little more than a week now. He is working on design of his piece in the work shop behind us, he will be working in glass and stainless steel. I have had many inspirations during my time here, Noell is very creative and as we discuss arts in general new ideas flow for both of us. The atmosphere and on site support that Haslla provides for the artists really helps us to do the best work that we can, win/win situation. We went to the city and chose a block for the wings, ready to begin work with the outline drawn. Today I cut a slot in the body of the eagle for his wings, with the stone cutting chainsaw provided by River City Developments in Red Deer it took less than 1/2 hour. I think it would be a full day's work or more to do this by conventional methods. I have learned that most cultures have totem poles. These are Korean traditional totem poles, they are usually placed at the entrance to a city or town and offer protection. These are at the University of Gangneung in front of the fine arts buildings. The stone sculpture department at the university, they have stone from all over the world in many colors and a well equiped shop. I was drooling over the rose, pink, black and pure white marble. This is another of Prof Choi's monuments, the columns are 18m, they stand in a pool with huge stones the shape of the continents. One column represents education, another work and the third life at home...elements of a successful life. The columns are reflections or in rhythm with the architecture of the library behind. On the left Noell and Prof Choi are standing in front of the stone mural which is also part of the sculpture. Rice for the restaraunt is grown right outside, harvested rice is hung to dry in this photo. The home at the restauraunt is more than 300 years old, doors, ceilings and all are works of skilled craftsmen and artists. Our communication is not excellent but I understand that this lady is Prof Choi's grandmother's sister. I'm not very good at that lineage thing but I think that would make her a great aunt. I also understand that she provides the recipes for the traditional foods they serve, it was delicious and beautiful. This monument and the busts shown above are one of the monuments created by Prof. Choi. Too bad it was raining all day but if it hadn't been I would likely have stayed at Haslla and worked. These are sculptures where we went to select stone for the wings of the eagle. Kyan the owner is also a very talented artist. A work in progress by the sculptor shown a couple of pictures up, the detail is incredible. I have had a couple of days to work on details, with those either designed or finished I can move ahead with the other two elements of my piece, the eagle head and wings. Here is the body with traditional decorative features. My worksite doesn't look a lot different than it did in the last picture I posted but a lot has been done. Some details on the frog, beaver's head, eagle's body and the dragonflies are complete. I like to keep my working area neat ande clean, this picture is taken before starting work today but looks about the same except for tools while I am working. I really liked this bench and the rest of the sculpture that it was part of but I didn't get a good picture of the whole thing. At least I got a pretty good shot of this portion of the sculpture. The rest was a tall vertical construction in the same style, reminding of folded cloth or paper. I can't read the interpretations so have to imagine what the representation is. I can't do justice with a camera to the view from my hotel but this gives you an idea of what I see out the window when I wake up. Actually I think I have only seen this a couple of times as I usually walk up the hill to my work area before daylight to get started and make good use of every daylight hour I can. A functional sculpture in one of the sculpture parks we stopped to see on the way back to Haslla, a chair. We aren't always serious of course so a little hamming it up for the camera. On the return trip from Busan we stopped at another city that is steeped in culture. The history goes back thousands of years and they have a big park committed to the culture there. This tower was really something, from the top you can look out over the whole city. The negative space has the same shape as a famous temple here. I have seen several log houses, this street in Busan reminds me a lot of Banff. Actually a lot of similarities with Alberta; pine trees, dragonflies, crows, mountains, etc. Sometimes I forget I am on the other side of the world. Viewed from the other side of the room you can see each one is painted with bright colors. Is this talking about summer and winter or before and after a nuclear event....makes you think anyway. This installation was in another venue, a warehouse turned into a gallery. As you can see there are a few thousand plant forms, they are cut from stainless steel by laser. I think the bienelle runs for a couple of months. Includes a film festival and lots of other artsy events. An installation, I think it was titled "Evolution". The Museum of Fine Art was one of the venues, we spent at least two hours doing a whirlwind tour, I liked this piece that included photography, weaved human hair and eggs. Functional art is really neat, I thought this bench was great. I am negligent in not making a note of artists names or titles of the works, this constructive sculpture is from granite. Although my sculpture here seems pretty big to me this puts it in perspective. This is one of the sculptures done at the bienelle, just to give you an idea of the scale I made sure someone was in the picture. On Saturday Prof Choi took me along with three other sculptors to Busan to see the Bienelle there, it is an incredible art festival. Anyway, the Gorilla restaraunt was beside our hotel and I thought the wording on the sign outside the door was humorous. My translation into Korean would be a lot worse than this but I still get a chuckle seeing some of signs and advertising. I could write a book about translations, eg. when Carlos from Cuba was here last year I wanted to tell him that a bottle of stone sealer was not polish. I use a translation program on the computer so typed in "the product in the blue bottle is for sealing" The back translation said "the product in the blue bottle is for killing seals" My next try was "it is for sealing the stone" it came back as "for putting a postage stamp on the stone" ....had to phone someone that speaks Spanish to get that point across. Ok and I at my work site. He is a sculpture graduate of Gangneung University. I think there is something about the diet here and in much of Asia that keeps these people looking young, Ok is 29. Fresh vegetables, kim chee, and soup with every meal has to be healthful. Year and model? Definately a Jag. For the car buffs, I guess it is a little off topic but there are a lot of "rides" here that are works of art. I don't know what make this one is but had a lot of carbon fiber parts, billet rims etc. I can't take time to get photos of all the neat wheels here but today I decided to walk around the parking lot and take some shots for the boys...ha ha, you would be drooling. The hotel staff are great folks, we have good laughs despite my limited Korean, actually that is likely the source a lot of times. I have learned water, thank you, hello, etc. Seem to get along pretty good with a limited vocabulary, reading and writing is impossible for me. There are dragon flies everywhere, that inspired me to include them in my sculpture. All of the children recognize them immediatly...chum cha dee is the phonetic spelling for the Korean word, frog is kay goo dee and beaver is....beaver. If I had to make a sculpture for every word I learn it would take me a thousand years to start speaking Korean. After roughing out I have to decide on details I can do with the tools and time I have. The dragon flies will get some decorative design on the wings and body.